Don Stewart, a long-time junior hockey coach in Simcoe, Waterford, Hagersville and Port Dover, was a dedicated volunteer for the 40 years leading up to his induction into the Norfolk County Sports Hall of Recognition. He had coached, managed, and been president of junior hockey teams for a large portion of that time. 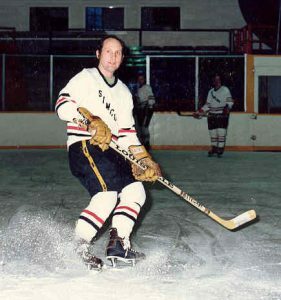 Stewart coached a number of successful junior squads, leading teams in Simcoe and Waterford to league championships in some of the most memorable games played in either arena. During his playing career, Stewart was a member of two OMHA championship teams but it was a trip to Helsinki, Finland in 1981 as a member of Team Canada in the Old Timers’ World Cup along with a Canadian Old Timers championship in Vancouver in 1980 that stand out as most memorable. When his playing and coaching days were over, Stewart turned his attention to fund raising and organizing. He co-chaired the Score-a-Million campaign for the Talbot Gardens renovations, was a member of the Norfolk General Hospital Thanks-a-Million campaign, and headed the Norfolk County elementary school campaign to raise funds for the Lloyd S. Culver Grandstand, Camp Trillium and the Family Fund. He has also been a member of the Simcoe and District Youth Soccer Park fundraising committee and South Coast Special Needs Kids. Don has been a tireless organizer, media contact, and MC for a number of events, including the Rob Blake Stanley Cup Celebration, the Red Kelly Homecoming and a number of Sports Hall of Recognition induction ceremonies. Don also served a stint with Amtelecom Cable 5, broadcasting hockey, curling and soccer, but it is his organizational skills and fundraising activities that have gained him recognition throughout the community and beyond.